Finally Sylvain, we meet again. Take a pew! What news do you bring? I trust Lady Luck has been a good friend to you over the last few months? She’s been good to us for two years now. Her best present was a stable and complete line-up! Thomas Bastide, the second guitarist, who made his only appearances on “Dancing In Moonlight” and “Violet Rainbow” on “Masters of Magic” LP as well as “Clear Windowpane” for the Saint Vitus tribute is now implicated on all the songs of our forthcoming “Chimères” LP. We have reworked some of the songs recorded for it to extend the contribution of our new bassist, Thomas Boivin and our full time keyboardist, Emmanuel Peyraud. Furthermore, we finally recorded 8 more songs, one of which will appear on the Hawkwind tribute boxset, “Daze Of The Underground”. The stability of this line-up also helped us to do the Doom Shall Rise II, which was another present from the Lady Luck! We are more than confident about the future of our team. We are working a lot and we have composed enough new songs to complete our fourth album! But now we hope to play live more than we do in the past. Marvellous news! You cannot fully appreciate how pleased I am to be listening to the new record and not simply because it is a delight to behold. I honestly feared the band was no more. There have been none of the customary compilation or tribute appearances and there was little to no news prior to the billing for Doom Shall Rise II. Why the silence? Was it deliberate? We must admit that we are not the champions of communication and promotion! But Emmanuel, our keyboardist, does not agree with us on this point and he’s doing his best to kick our asses. His first move was to create our website: www.northwinds-music.com But don’t forget we had to face line-up difficulties once again, just after the release of our second effort. That forced us to go back to square one. May I say your return is most welcome! How did you find the Doom Shall Rise II experience in Germany? Please share with us some of your most poignant memories of the festival. Thanks for your kind words! DSR II was more than a good experience. It was the recognisation of our Doom Metal status as it was our first gig outside of our country! All the people we met were very kind and open minded. The experience also proved that everyone in the band was pursuing the same goals and it has reinforced the communication between us. Our must poignant memories centred on meeting Count Raven and some of the guys who have followed Northwinds for many years now and to see how much they still support us. It gives us the strength to carry on. Was it the first live appearance of the band in recent times? I imagine there must be rather limited opportunities for Northwinds to play in France. How then did it compare to gigs you have played in the past? We had done two concerts prior to the DSR II and they are no possible comparisons to it.. It was the first time we have the opportunity to do a performance with a real light show, a real good sound and most importantly, to a real Metal crowd who know about Doom Metal in all its guises. I think that in the future we will have to search to play live outside of France because Doom Metal is not a winner here. Well, I am satisfied that the band is still very much a going concern. For those who have yet to be initiated into the coven, how would you introduce Northwinds here and now? Please describe your style, flavour and content. Do you have a message to share? We are very much a band of contrasts and moods. We do not hesitate to use the kind of instruments you are not use to listen to in classic Heavy Metal. We are much in the vein of the heavy music developped in the ‘70s, which was often labelled at the time as progressive. It was free from all trends without a neat pigeon hole. Thanks to Cathedral, they have shown the way to reaching a large Metal public and helped the seeds of a once glorious past to grow again. Our label, until now, greatly helped us to develop that side of our music. They know what we’re talking about. It is a real progressive label that focuses on the heavy side of the music! To put it simply, we are a mix of our roots. That includes a lot of groups from this beloved heavy and progressive era from the ‘70s, folk music, especially the brand made in Britain, which also had a great impact on the French scene that lasted til the late ‘70s and has returned only five years ago. If you want names, think Alan Stivell, Tri Yann or Clannad. But overall, our major influence is BLACK SABBATH and all the bands that have a link with their sound. We have seen and lived through the evolution of the scene from “Sabbath clones” as you read about it in the early 80’s to “DOOM METAL”. Our music is also a blend of the ones who still had a foot in the ‘70s such as Witchfinder General, Quartz, Witchfynde and the radical development embodied in Trouble, Saint Vitus or Candlemass. 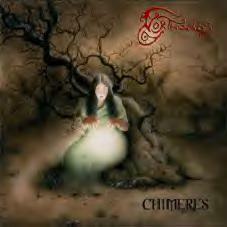 Your new record, “Chimeres” bears an intriguing name with a range of possible meanings. It could describe the different sounds, movements and ideas that collectively form the album or it could equally represent the difficult process involved in completing it, one which you thought may have been unattainable. Can you offer any insights? Your view is an interesting one and you cannot be wrong. The title is, once again, intriguing so the people do what they want with it. I love it when listeners are constructing their own conceptions with our titles and talk with us about their views. It is always an enriching experience for us. They are many meanings in this title but the one that is most prominent is idle- dreams. Sometimes you spend your life pursuing idle dreams. They make the return to reality harder and even destructive. They are like sirens. Here we choose the chimeras: monsters and lies. There is often talk, primarily in the media, of the difficult third album. I have a problem getting my head around the concept. Then again, I am not a musician. But to my ears, it sounds like “Chimeres” came even more naturally than your first two albums. Would you agree with my interpretation? Is the difficult third album then a myth? What you say is naturally correct. However, it reflects our maturity. We feel that the mix of our different faces and colours is more coherent than ever. It is natural. Personally, I feel that the lyrics and the musical parts are more overlapped although we always took care in the past to develop this aspect. To have a full time keyboardist also helps us a lot. He sees himself as a sound designer and it cements our ideas more effectively than before. But remember it is a collection of songs written by two different line-ups and on the previous album there were three! We all think that the difficult album, with every one waiting for you at the corner, will in fact be the fourth one. As a whole, it is a particularly compelling album. It is well written, it carries all of your signature touches and is delivered with real panache. Perhaps the band has not yet had enough time to distance itself from the recording process. But how do you rate it? Do you wish you had done anything differently? It’s impossible to be happy with everything. We appreciate that we still have to make efforts to perfect the sound register and recording techniques. On this point, there are many regrets. We were certainly better prepared than our previous times in the studio. But there is always the improvisational aspect here and there. We always regret it afterwards. But as time passes by, we can see tha listener loves it a lot and even considers that it is our mark, our 70’s touch. But please don’t put our errors and our liberty of improvisation in the studio in the same league! In the past, you have described your music as an array of colours that blend and disperse. The notion intrigued me and on this basis, the new record has been put to the test. Please share your views on the crude theory that follows. Red is blood and the substance of horror. It is the haunting “Winds Of Sorrow” and “Crystal Ball”. Without dealing with the lyrics, I agree with you. Your propositions are logical except “Crystal Ball” has nothing to do with horror or blood. Then it will come as no surprise that I struggled most with that song as I think there are elements, which would pull it to each of the categories! You announced some time ago that interpretations of Ange and Witchfinder General would appear on this album. But was there any initial debate around the bands or specific songs that would be incorporated in it? Why did you finally settle with them? Black Widow Records asked us to cover a song by the progressive French masters, ANGE, because they are great fans of their music. They proposed “Le Soir du Diable” to us. Even if we would have like to cover another one we’ve chosen to do that one for them as some kind of present for Massimo and Pino! We are very happy to have done it! It was a real adventure for all of us and we had a lot of fun doing it. The way we have reworked it improves it. We are far from the original version. But I think that we have kept its spirit alive. As always, we have worked it as it was one of our own compositions. Everyone in the band loves it! The dream to cover a Witchfinder General song goes back to the beginning of the band. We never realised it at the time, but on the first album you will notice that “Forest of Konkoret” is sub-titled “Friends Of Hell” so it was natural to follow through with it. But due to lack of time and personal difficulties for some members of the band, doubled with a natural tendency to be lazier than anyone could imagine, we finally began working on “Music” from the same album. It was a good idea because it helped us to play with joy again and with some friends implicated it became a feast! But our label mates don’t like this song! For them, it is the worst song the duo Cope and Parkes ever written! They encouraged us to return to our original plan and cover “Friends Of Hell” with the result that we have recorded two Witchfinder General covers. I’m now more than happy! “Friends Of Hell” will appear on the CD and we will add “Music” to the LP version. I love the ‘80s feel of “Music” and the heavy keyboard instrumentation would be ideally suited to Northwinds! I look forward to hearing it. Anyway, somehow both cover songs feel integral to the flow of the music. “Le Soir Du Diable” extends the macabre ambience of the red songs then “Friends Of Hell” provides a fitting blue contrast and upbeat close to the album. Were they intended as more than simple bonuses? There seems to be an unspoken rule that Northwinds will always go that mile further to make a cover song their own. Why is that so important? Please do! Northwinds also invests much time and effort into lyrics and vocals. Who takes the initiative when it comes to creating the words and melodies? How do you decide which parts Vincent will sing and which parts you will sing? There is no calculated thing here. We have been working together for so long now that we know which one will have to pen the lyrics and sing without discussing it for hours! It is a pleasure to hear that the French language continues to hold a place in your songs. Have you considered expanding its role? Without meaning any disrespect, surely it would be simpler to express yourself in your mother tongue? What then is your motivation to sing in English? Oh, yes it would be logical in the way that our English is not the best to be heard or read over the earth! We are the subconscious victims of strange prononciations, th sounds like z, “Ze Night Of Ze Witch! (laughing) It is guaranteed to be a good laugh for our English listeners! We always regret it the morning after. Raise your tankard and celebrate German Thrash! But it is not easy to make the French words sing. We would be more exigent and pestered by too many questions. We feel free with English. But there is no shame for us to sing in French. Two songs are in French on “Chimères” and even the title of the cd is in French! We will do it every time we feel its suits. However, we have listened to the English language through the years via our beloved bands so it’s a natural movement to associate it to our music. In fact, we never really think about this problem. But it is clear that we do not find it easier to write the lyrics in French! Would you be so kind as to elaborate on the themes behind “Le Cercle Des Fees” for those, like myself, who have a limited grasp of French? Is the Fairies’ Circle more than a symbol to you? Circles of fairies are frenetic dances. Mortals have to stay away from. If caught in the round, you will have a lot of fun. But with the first light of the morning, when the fairies are gone away, you discover that you are now very old because in the fairies’ world time has not the same value. After some minutes of delight your life is gone. It is symbolic of course. As you may see, there are a lot of ideas behind the theme. One reading could be as you blinded by bright lights and sweets, you choose the wrong way. Here the fairies are our sirens although, in that case, they are not consciously working for you undoing. On this level, the song is the counterpart of “The Forest of Konkoret (Friends of Hell)” on our first album, “ Great God Pan”. There seems to be a general extension of the mystical themes contained in your previous albums to “Chimeres”. How have they developed throughout the years? And are there any significant differences between a song like “Great God Pan” and “Dusty Pictures”? There are some extensions. “Le Cercle des Fées “is the counterpart of “The Forest Of Konkoret”. There are also parallels between “ Neverneverland” and “Northwinds” although that is all. I think the lyrics are now more direct and not just an evocative suite of words. In a way, they are maybe more down to earth. The words stand for what they are and not too much for the images they carry. That is the major difference between the likes of “Great God Pan” and “Dusty pictures”. Which composition on the new record makes you most proud? Why? Have you, once again, asked Danielo Capua to prepare the illustrations for the front cover and inner sleeve? Who is the woman peering into the crystal ball? Yes, we asked Black Widow Records to contact him. But they have chosen to work with another artist, and until now nothing we have seen has gained our approval. I know the label will propose a new illustration. But we will try, on our side, to obtain something more in line with our views. We have already taken care of the concept of the booklets for the CD and LP. After all, some of us in the band find it natural to achieve the work by taking care of even the illustration of the cover. I know that our label adores being included in the artistic point of view of their bands, and liking to follow some logical image of the label, some kind of trademark! It won’t be easy to find a compromise! The woman with the crystal ball has already been used by the label for promotion, and at a time we decided to choose it because we were deceived by the other propositions. But it is quite far away from the concept of the record. We hope now to find a solution as soon as possible to achieve our work. When do you anticipate the eventual release of the album? To what extent do you intend to promote it through the traditional means of touring and replying to interviews? We still have to work on a few things to make the vinyl edition a real gem so it is hard to give you a date for the release. We hope to see it in our hands before the first flakes of snow! Yes, we hope to play live to promote it. We cross our fingers! Our live development would be a logical evolution, and we all think that it is now a condition for the duration of the band. Every help will be appreciated. Black Widow Records has played a pivotal role in the history of Northwinds. Have you felt like a valued member of their musical family over the years? Could you imagine have taken the journey with any other label(s)? To work with Black Widow was the supreme gift of Lady Luck! We are always feel free because in our minds we are in total osmose with the concept of the label. We don’t wish to work with another one so we cross our fingers! If line-up instabilities are now a thing of the past, touch wood, where do you foresee the band going from here? Now we have the chance to work as a unit and our goal is to play live as much as possible. We have already worked on a lot of new compositions. There is enough for the fourth album even if the third one is still in Limbo! We are keen to return to the studio. Do you feel Northwinds belongs to a wider musical collective in France or further a-field? Are there any bands with whom you share a natural affinity regardless of superficial boundaries? That is a difficult question… In fact, we feel very close to the Doom Metal scene although we have a foot in some kind of ‘70s revival. 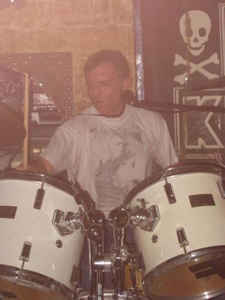 I have read that some people consider us as a band having a Stoner Rock touch! However, we don’t mind because our heart belongs to the Doom Metal scene. It is the one that carried the heritage of Black Sabbath and from whom we have also retained the progressive dimension. While I am not well versed in Ange I would like to hear more of their music. Where would you recommend I begin bearing in mind my preoccupation with the darker and heavier side of things? Have you any other recommendations? I recommend the album “Au-Delà du Délire” FROM ’74. I think it would be easy to find it on CD. I would also recommend SHYLOCK. But do not forget SORTILEGE and BLASPHEME! How could I? I love French Metal! Anyway, as a man of literature, which authors or poets would you recommend to the Northwinds audience? Just take the time to visit our website at www.northwinds-music.com In the links pages, you have the opportunity to visit websites dedicated to some of our favourite authors! In the past, I have enjoyed reading some stories by Maupassant. However, “L’ Etranger” by Albert Camus remains my favourite piece of French literature. Have you any other thoroughly French recommendations for me? On the fantastic level, try Jean Ray who is in fact from Belgium. “Malpertuis” is well-known and considered as his masterpiece. But there is a huge collection of novels, sometimes written under the name of John Flanders, that are also worthy. They show a writer who is able make you share the internal life of his heroes as well as brilliant macabre stories. Claude Seignolle has written a lot of stories influenced by local superstitions and sorcery. He creates a special and bewitching atmosphere akin to Arthur Machen. Maupassant is also a very good reference. You may try some stories such as “Avatar” by Théophile Gauthier. On the classic side, you have in Ireland good references: Fritz James O’Brien and J. Sheridan Le Fanu. And the stories of Lord Dunsany are treasures, time and space without restraint and a golden key for the world of dreams! Previous commitments have prevented me from travelling to France. However, I intend to remedy that next year. If I could only visit one place where would it be? Why? Paris! We will be able to meet and there are a lot of second hand records shops!!! What do the following images inspire in your mind? The Guillotine: “Rendezvous with the blade”…”Frontal Assault” by Angel Witch! I hope that one day “Screaming and Bleeding” and “Frontal Assault” will be recognized as good albums. They were shunned fifteen years ago and it’s a shame! Mushrooms: One of my numerous passions! Finally, if you could ask me a question, Sylvain, what would it be? Is Lord Dunsany recognized as a major author and poet in Ireland? He’s a kind of myth for us and some of his works had been recently re-released. Thank you for taking the time to answer my questions. I hope you found stimulating. Good luck with your ongoing quest! The closing sentiments are yours. Many thanks for your interest. We hope to see you soon in Paris!